There are many ways to sharpen a knife edge. It’s pretty much an age-old science that hasn’t changed much. But often knife sharpeners fall into two categories. Either they leave too much room for error or they are entirely too complicated. The new Guided Sharpening System from Work Sharp (MSRP $59.95) falls back on the time-tested methods for sharpening knives while taking out as much room for error as possible. It does require some technique though, but after watching a short video the device started to make sense. 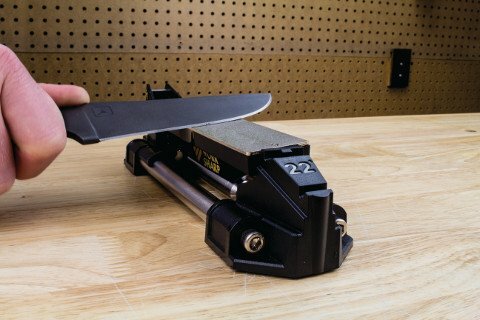 Several design features make this sharpening system stand out. For one, it utilizes Pivot-Response Technology that tilts the sharpening surface to match the contour of the blade as you slide it across. This is great for keeping the tip of the knife on the diamond sharpening plate as I found with each stroke the sharpener would tilt at the end. Another great feature are the angled guides that allow you to check that the blade is coming at the sharpening surface with the appropriate angle. In most cases that’s 22 degrees. The instructions also provide a worksheet for each setup depending on what type of blade you are sharpening. You can change it to 17 degrees. All of these pieces including a ceramic honing bar can be interchanged on the mounting system with magnets. So too the sharpening plates fasten tightly to the device with magnets, and there’s weight to it so it stays in place. The whole device is only 8 1/2 inches long, which lets it tuck away neatly on any work bench. At first the Work Sharp system feels a bit confusing, but after watching a short video on the company’s website it became much more clear. The sharpening still requires a fair amount of user skill as it doesn’t just sharpen the knives for you. You actually have to follow directions, but once you have experience sharpening certain blades and the sharpening plates that work best, you should be able to get into a routine. In our review, we sharpened a set of used kitchen knives, putting them through the recommended strokes on the diamond grit plate and then the ceramic honing bar. After 5-10 strokes on each side per plate, we tested them on a pile of vegetables and a slab of meat, and the knives performed like new. No question this is an excellent knife sharpening system that’s simple and easy to use for even the novice sharpener. Guided Sharpening System – Work Sharp from DAREX on Vimeo.